For the second consecutive year, the Cubs’ Anthony Rizzo was involved in a controversial slide at the plate. Following is the report from MLB.com. 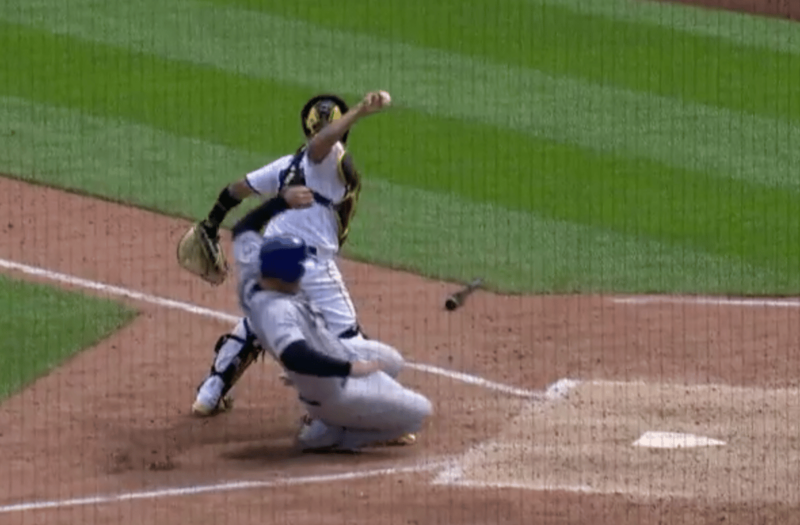 In the eighth inning of the Cubs’ 7-0 win over the Pirates on Monday afternoon at PNC Park, a replay-review ruling on Anthony Rizzo’s hard slide into catcher Elias Diaz stood, resulting in the ejection of Bucs manager Clint Hurdle. With the bases loaded and nobody out, Cubs catcher Chris Gimenez hit a ground ball to Pirates shortstop Sean Rodriguez. Rodriguez made a clean throw to Diaz, who had his foot on home plate to record the force out on Rizzo before stepping forward to throw to first base. Rizzo slid into Diaz’s right ankle as he went home, tripping up the catcher as he released the ball. Diaz’s throw sailed into right field, and Javier Baez and Kyle Schwarber scored on the error. As Diaz rolled around in front of the plate, Hurdle asked home-plate umpire Bill Welke and crew chief Mark Carlson to review the play to determine if Rizzo violated the slide rule. Cubs manager Joe Maddon also got into a heated argument with the umpiring crew. “My baseball sensibilities are impacted by that. It’s the perfect play by Rizzo,” Maddon said. After a nearly three-minute review, the call stood. Rizzo was ruled out, but the replay center found no evidence to determine that he had violated the slide rule. Hurdle continued to argue and was ejected. If you read the first sentence of rule 6.01 (i), it reads, ” A runner attempting to score may not deviatefrom his direct pathway to the plate in order to initiate contact with the catcher (or other player covering home plate), or otherwise initiate an avoidable collision. If you follow Rizzo’s path to the plate, he ran the first 80-feet or so in foul territory and the last 10-feet in fair territory. Part of his body ended-up in the left-handed batter’s box. I would say that was evidence that he deviated from a direct path to the plate. In my opinion he targeted Diaz. For what other reason would Rizzo run into fair territory the last 10-feet or so when the catcher was giving him a lane? The fact that he ended-up in the left-handed batter’s box reveals his intent on this play. He said after the game that his intent was to break-up the double play. Traditionally, runners who break-up DPs normally deviate from their pathway. Rizzo blindsided the catcher on a force play when there was no play being made on him at the moment he made contact with the Pirates’ catcher. Diaz gave him a lane but he blatantly ignored it. He was already out when he blindsided Diaz. Gimenez should have been also called out for Rizzo’s egregious actions. The Replay Center said that Rizzo made a legal slide. That’s a separate issue that deflects from the actions of the runner who targeted the catcher. What is the point of legal slide after the runner has targeted the catcher and made contact? The fact that it took NYC nearly three-minutes to come to a decision tells me that there was debate. In my opinion the Pirates also had case involving rule 6.01 (a) (5). It reads, “It is interference by a batter or a runner when any batter or runner who has just been put out, or any runner who has just scored, hinders or impedes any following play being made on a runner. Such runner shall be declared out for the interference of his teammate. In the future, if a manager challenges such a play, I would emphasize the “deviated from the direct pathway” language of the rule. If the catcher blocks the plate during a force play, there should be no violation. Diaz gave Rizzo a lane in a force play situation, and as stated, he did not take it. How can anyone not argue that Rizzo did not deviate his path to the plate to make contact with the catcher? Why have a rule if you won’t enforce it? I agree with Clint Hurdle and Andy Green in both scenarios. But it’s only my opinion!